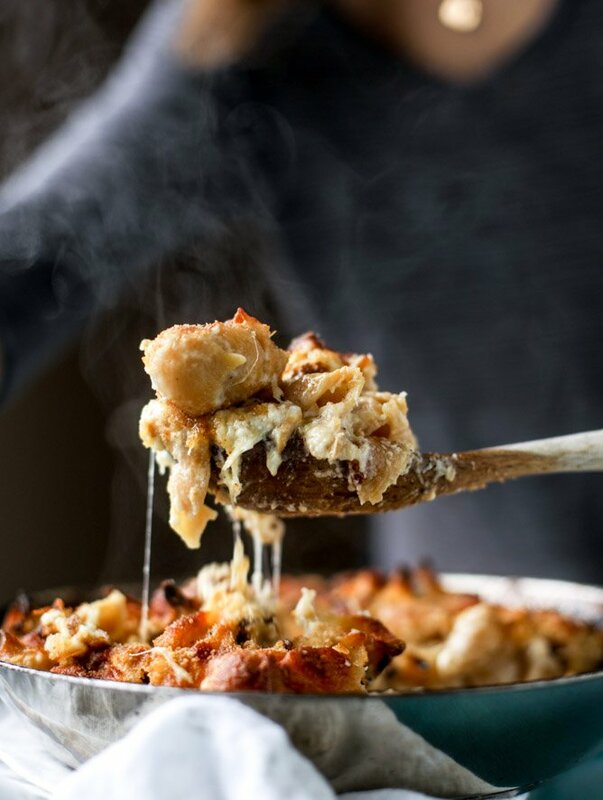 Roasted Cauliflower Shells and Cheese. Since it’s Monday, I felt like vegetables were required. RIGHT. I knew I could count on you. Counting on my veg AND invisible internet friends this morning. So healthy all around! Even though cauliflower was one of the first vegetables that I found remotely tolerable, I still don’t use it enough in different and unique ways. Years ago I discovered that when it was roasted – like really, really roasted – it almost took on a popcorn-esque flavor. Since then, I want to roast it for every single dish we make with it (hellllo charred cauliflower carbonara) and apparently I’m not stopping here. At least this is better than other options that I felt were necessary when eating vegetable florets. I might have even considered chocolate sauce in my younger days. Proud of it. My heart skips a beat at the sight of this cheese sauce. And I just wrote “beet” so I must have vegetables on the brain. And then I wrote “site” instead of “sight” so I’m trying super hard to not hate myself at the moment. THE INTERNET HAS DESTROYED ME. But look at that stringy, delicious cheese! Heart hurts. I used my favorite whole wheat shells, a super melty fontina and havarti cheese sauce and lots of roasted cauliflower. Contrary to other recipes I’ve seen, I did NOT make the cheese sauce out of cauliflower. I simply roasted the heck out of some cauli and threw it into the shells and sauce. It was SO good. So, so, so, so good. Even if it does look like we are on the beige diet here. Preheat the oven to 425 degrees F. Place the chopped cauliflower on a baking sheet. Toss it with the olive oil, salt and pepper. Sprinkle with the garlic powder. Roast for 20 to 25 minutes, until golden and slightly charred. Reduce the oven heat to 375 degrees F. Bring a salted pot of water to a boil. Heat a pot over medium-low heat and add butter. Once sizzling, whisk in the flour and cook until fragrant and golden in color. Slowly whisk in the milk. Cook until the mixture thickens, about 5 to 6 minutes. Reduce the heat to low and stir in the cheeses, one small handful at a time, until melted. Stir in the mustard, nutmeg and a pinch of salt and pepper. Cook the pasta according to its directions. Once the pasta is cooked, stir it and the cauliflower into the cheese sauce. Pour the pasta in a dish and top with the breadcrumbs. Bake for 30 to 35 minutes, until golden and bubbly. Top with fresh herbs before serving. Sometimes this is my version of feel good food. This looks sooo good! Am I missing the pasta in the recipe? this was so good. I’m trying hard not to make out with my screen. OBSESSED with this. So obsessed. Roasting is the way to prep cauliflower. Covering it in cheese and garlic? Genius. Brilliaaaaant! Getting your veggies in while still having good ol’ mac and cheese. Love. YUM!!! obsessed with this idea Jess, sounds so good! I just made cauliflower arancini so I am totally on the cauli train myself — those Trader Joe’s riced bags are the best! I love healthy food disguised as something super cheesy! This looks SO incredible. The epitome of comfort food. Fontina and Harvati. It sounds like a European music group that sings love songs. Sign me up for this meal! Making this asap. My daughter just discovered the joy of roasted veg, so I’m riding this train until she decides she hates them again. Speaking of hate? THE AFFAIR finale? What the what? Horrible. 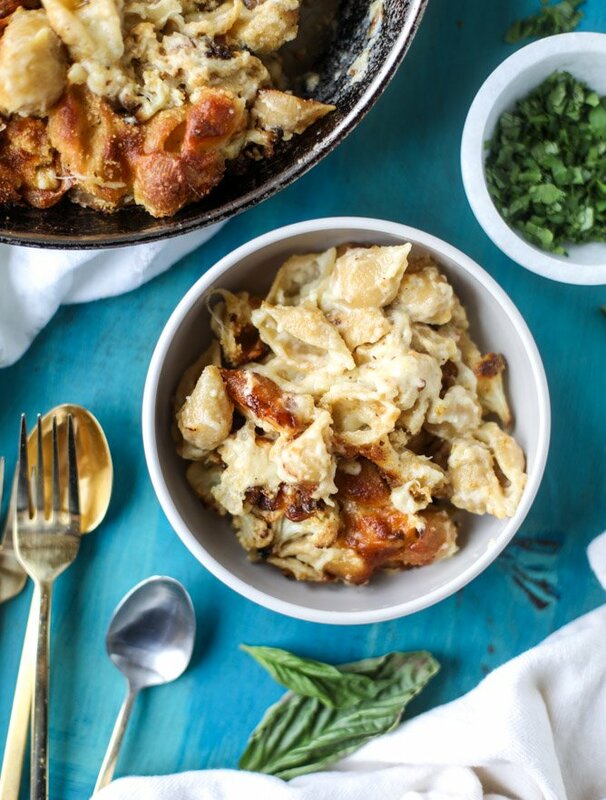 This looks amaaaaazing and I’ve been on the lookout for a new baked mac and cheese recipe! However I’m the weirdo who doesn’t love a ton of stringy cheese, would you have any recommendations on another type? thank you! This is odd. I copied the link in Bloglovin to save for later. When I notice the amount for the shells was missing I came back to the site to see what I missed. And this is a whole different recipe from the one I saw first. 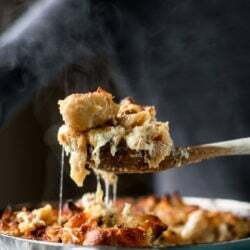 Here’s the link to the Bloglovin’ recipe – https://www.bloglovin.com/blogs/how-sweet-it-is-1439878/roasted-cauliflower-shells-cheese-5420627951. I’m making this right now so I hope the cheddar and gruyere is also a good combo. I want all those brown breadcrumb bits! When you measure out 3 cups of pasta is it cooked or uncooked? Oh, hello recipe that just launched itself to the top of my to-do list! Thinking of using both cauliflower and broccoli cause that couldn’t hurt one iota. Time to go shopping! Girl you are hot fire flames this week! ??? Back to back cheese bread/mac and cheese?!? Yum! Cheese and cauliflower might be two of my favorite things. This looks amazing! I love your simple comfort food recipes! Totes counts. Even if it’s disguised as comfort food! This look amazing! Perfect for my superbowl party tonight! Any alternative to mustard? I made this omitting mustard but feels like it’s missing something, and I HATE mustard more than any thing so would ruin the dish for me.